200g of hot smoked salmon (flaked into chunks). Shake of chilli powder (optional). 2 tbsp Parmigiano Reggiano hard cheese (parmesan) grated. 45g pine nuts (to sprinkle on top). Cook pasta in boiling salted water for 12 - 15 minutes. In the last five minutes of cooking the pasta, pour the wine into a shallow pan, bring to boil and simmer for 1 minute. Reduce the heat and stir in the cream and add seasoning and a shake of chilli powder(optional). Stir and allow to simmer for a further 1 minute. Drain the pasta and add to the sauce. 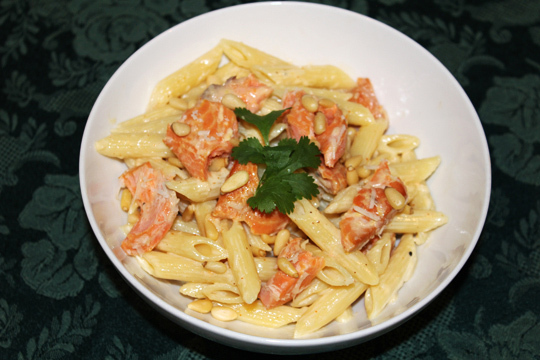 Add grated parmesan cheese, stir and add the flaked hot smoked salmon. Plate up and serve immediately. Sprinkle the pine nuts over the top and serve with a crusty bread and side salad.